In This Article I am Going To Show You How To Get Adsense approval In Blogger.com . This is Very Easy To Get Adsense approval in blogger site Just Flow My Process . Don't Use Free Domin Name Like tk,ml,cf etc. ...Get Free Top Domin Name..
You Need at list 15 to 20 Post In Your Blog. Your Post Should Be More Than 200 Words. Write User Friendly article in simple words. Don't Create Complex Post . Create Sub-Title in Your Post which is help to Read Your Article Fast. Don't Do Copy & Past From Internet or other website. Show Your Creativity in Your Every Post. Try To Create Your Post In English. Create other 2 or more which is related to your article topic. And Bing or other website. Share your post in Facebook which is support you to get Traffic to Your Website at starting point. Create Video which is related to your Article and Give link in Video Description. 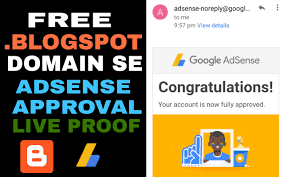 At Last Apply to adsense account with blog then you can get approved with in 48 hr.. for more comment in this post.